The idea of having dental implants may cause you some anxiety. What does it involve? Does it hurt? What about recovery? Getting the answers to questions like these will help put your mind at ease and enable you to get your missing teeth restored using this great technique in dental care today. 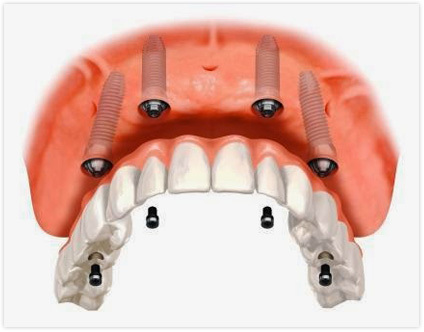 The actual process of getting dental implants is done in several steps. First, your dentist will perform a few simple tests like X-rays or CT scans to determine if you are a good candidate for the procedure. Then the dentist will create a treatment plan so that the implant is properly placed and has the best chance for success. The implant will be surgically placed in a separate appointment, and your mouth will be allowed to heal for a time period. Once healing is complete, a dental crown is placed on top to complete the implant process. Concern about the potential for pain in getting dental implants should be set aside; the surgery is practically pain-free. Dentists use anesthesia to provide complete comfort during the procedure, along with simple injections if necessary. You might feel vibrations when the new teeth are placed, but it is not truly painful. If you do experience a higher degree of anxiety about the process, your dentist may prescribe medication to calm your fears. Recovery from dental implants isn’t bad either. Sunrise, FL dentist Dr. Wohlstein will control any discomfort with medications afterwards, but the soreness you might feel is comparable to the after-effects of having a simple cavity filled. Most patients only need over-the-counter pain relievers for the first day or two after receiving implants, if at all, and then return to normal routines and comfort levels. Dental work can be a scary situation for patients, but knowing what to expect is helpful in reducing anxiety. Modern dentistry allows dental implants to be a life-changing way to restore your oral health. Schedule your appointment today to see if dental implants are right for you.